" Swollen or raised skin bumps have multiple causes which are described below. The appearance of skin bumps or lumps may be rough or smooth, soft or hard, and dark or light colored. They may occur as a single lesion or as multiple raised areas on any part of the body.These bumps may appear in one area of the body, but they may also cover large areas of the body." Tiny bumps on the face caused by Milia. It can make your skin feel like sandpaper. Common in people that wear heavy makeup. The bumps are caused by dead skin cells and trapped oil. It is treated with an electrified needle or an extractor. They can be easily removed by a Dermatologist or with a home Comedone Extractor. Pictures of skin bumps caused by boils on the chest. Furuncles, Boils, or skin abscess which are due to bacterial infection. An abscess is a collection of pus within the dermis. It is frequently surrounded by a red skin area. An abscess is treated via an incision and drainage. If caused by a bacterial infection, treatment includes oral antibiotics. Acne or pimples appear on the upper chest, back, shoulders, forehead, and face. Dead skin cells block the sebaceous glands causing them to dilate and rupture. Dermatofibroma: benign skin tumor. It has a different color than the surrounding skin and is a dome-shaped papule. It is common to have a darker rim around the skin bump. The bump will feel firm. While most cases are benign (not cancer) the Dermatologist will do a biopsy to be certain. Bump on Leg Caused by Dermatofibroma. Folliculitis is an infection of the hair follicles. Insect bite such as from mosquitoes or bed bugs. 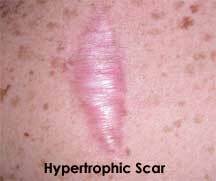 Keloid or an overgrown scars have a variety of treatment options. Treatment success varies from person to person. Appearance may be able to be improved with the use of products such as Scar Away and Scarguard. 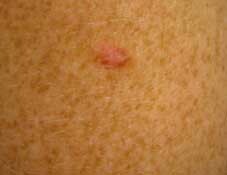 Melanoma,a type of skin cancer. 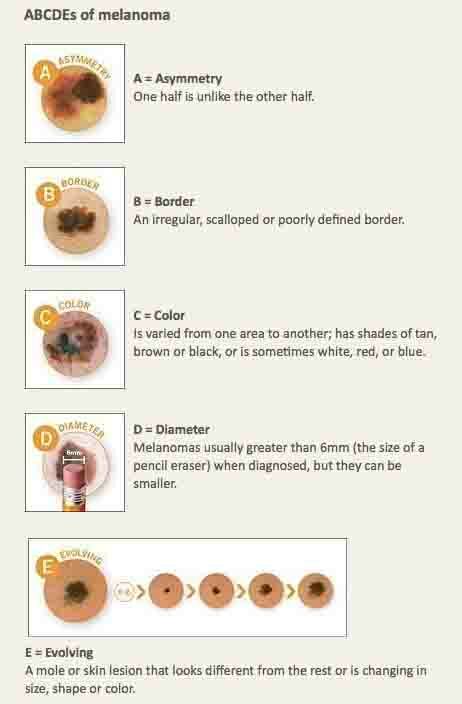 The American Academy of Dermatology provides the following guidelines for early detection. If you see any skin bumps or lumps changing in appearance, growing or bleeding, see a Dermatologist for evaluation. Moles or Nevi are common in all adults. Normal adult skin has 10 to 40 moles. Examine the skin monthly and see a Dermatologist if any moles change in appearance to catch any potential melanomas or skin cancer. Moles are usually not treated unless removed for medical or cosmetic reasons. A sebaceous cyst or epithelial Cyst is caused by blockage of an oil gland. They are one of the most common causes of skin lumps and bumps. They can occur at any location on the body, but are primarily found on the torso. Skin lumps caused by sebaceous cysts are caused by accumulating dead skin cells. The condition is not harmful and tends to run in families. Keratosis pilaris causes tiny skin bumps that looks like a plucked chicken skin or goosebumps. Pilaris are caused by plugged dead skin cells. The condition is harmless and is often a byproduct of dry skin. Skin Lump Caused by a Lipoma. It is a collection of fat under the skin. A lipoma is a fatty deposit under the skin and can be tender. It may grow slowly over time. They usually start in early adulthood. Lipomas can be surgically removed, but does not have to be removed. Dermatologist discusses how to erase tiny skin bumps on the face. Milia are small cysts that are 1mm to 2mm in size. They occur at all ages, usually on the genitalia, forehead, eyelids, and cheeks. The milia either appear with no known cause, or as the result of injury, reaction to medication or a disease. Milia can be removed with a blade without any scarring by a Dermatologist or with a home Comedone kit. 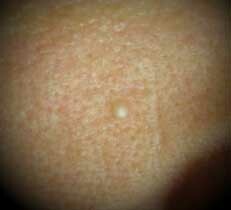 White tiny skin bump called by a type of cyst call Milia. Molluscum contagiosum, caused by a virus. 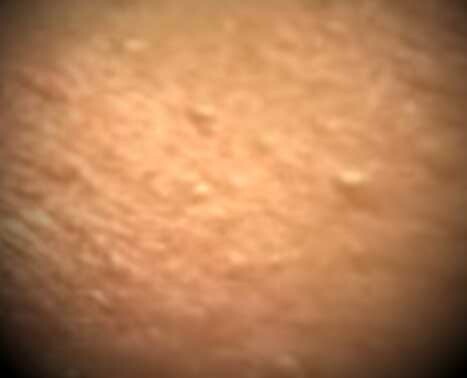 Skin bumps caused by Seborrheic keratosis. Seborrheic keratosis appears on all parts of the body. Color ranges from blue, pink, flesh-colored tan and black. Texture can be smooth to wart-like. Seborrheic keratosis will crumble or flake when picked. The skin bumps tend to appear after age 40. If it appears after age 50 a Dermatologist should test for skin cancer (melanoma). These skin bumps are harmless, but can be irritated by clothing. They can be cosmetically removed by shaving, electrodesiccation, or cryotherapy. Bumps on skin caused by a skin tag. Skin tags are brown fleshly feeling papules that are attached ot the skin with a stalk. They are found on the groin, below the shoulder, neck and eyelids. They are usually asymptomatic, but can become irritated or painful. They often appear during pregnancy. Other causes are obesity and genetics. Skin tags are removed by snipping, with electrodessication or liquid nitrogen. Some all off with no treatment. Warts or Verruca Vulgaris are rough bumps caused by human papillomavirus. When the virus enters the skin it results in a wart. In individuals with a normal immune system, the condition is harmless. They can be treated with a topical such as Naturasil. In some cases, a wart will regrow after treatment. The best approach is to treat the area again. See a Dermatologist for stubborn warts. The condition is contagious. Dermatitis, eczema, or rashes caused by inflammation or allergy. Many doctors may be able to diagnose common skin bumps from the medical history and physical examination of the patient. However, some doctors may request for laboratory examinations to confirm their suspicions or rule out other possible causes of skin bumps. These may include skin scrapings, skin biopsy, blood tests or more if needed. Depending on the cause of skin bumps, raised areas may vary in size, texture, color, and location. They may either be smooth or rough, firm or soft, very small to large. The skin may be pink, red, tan, light brown or dark colored. They may or may not be ulcerated. Some bumps are solid while others may be filled with fluid or pus. Bumps on the skin may or may not be painful to touch, and while some may be accompanied by itching, others are asymptomatic. Skin bumps may be found anywhere in the body, depending on the cause, from the scalp to the soles. While some lumps occur singly such as a cyst, others may be scattered or found in clusters. The appearance of any bumps on the skin may also be accompanied by other body symptoms such as fever (if caused by an infection) or difficulty in breathing (from insect bites causing a severe allergic reaction). The treatment of skin bumps will depend on the cause and accompanying symptoms which need immediate or long-term relief. Many skin bumps are harmless and may go away on their own, while others may need medical treatment involving topical medications, oral drugs or even surgery. Treatment may be directed at curing an infection, relieving itchiness or inflammation, treating a systemic disease (like a viral infection) or improving one’s appearance (cosmetic reasons).